The Hockey Stick became a central icon in the “climate wars,” and well-funded science deniers immediately attacked the chart and the scientists responsible for it. Yet the controversy has had little to do with the depicted temperature rise and much more with the perceived threat the graph posed to those who oppose governmental regulation and other restraints to protect our environment and planet. Michael E. Mann, lead author of the original paper in which the Hockey Stick first appeared, shares the real story of the science and politics behind this controversy. He introduces key figures in the oil and energy industries, and the media front groups who do their bidding in sometimes slick, bare-knuckled ways to cast doubt on the science. Mann concludes with an account of the “Climategate” scandal, the 2009 hacking of climate scientists’ emails. Throughout, Mann reveals the role of science deniers, abetted by an uninformed media, in once again diverting attention away from one of the central scientific and policy issues of our time. "The brilliant and courageous climatologist Michael Mann knows what it's like to be viciously attacked by the well-funded deniers of scientific evidence and how critical it is to respond. In this gripping, personal, front-lines account of climate politics, Mann tells the 'hockey stick' story, exposing the forces behind the denialist rhetoric, refuting the charges of disinformation campaigns, and eloquently conveying the importance of both doing great science and communicating its societal implications to a wider public. "Although not initially of his own choosing, Michael Mann has been the most important, resilient, and outspoken warrior in the climate battle--responding to threats and persecution with courage and resolve every step of the way. Anyone who cares about the climate issue must read his fascinating--and enraging--story." "In The Hockey Stick and the Climate Wars, Michael Mann presents his conviction that climate change is real and potentially deadly, and defends his now famous 'Hockey Stick Graph.' A truly readable book on a topic that will remain evergreen." "A must read to appreciate the endless disinformation campaign by climate change deniers at the highest levels of government and corporate America...and the chilling, but serious implications of the crusade to discredit distinguished scientists like Michael Mann." "As one of the nation’s leading climate researchers, no one has felt the brunt of the attacks from politicians and the fossil fuel industry more than Michael Mann. This is his personal account from the center of the maelstrom, documenting the lies and distortions about his work and his heroic efforts to stand up for scientific truth." "If you don’t believe our climate is changing, read this book. Dr. Mann will change your mind. For us, it’s a war of words. Preserve the Earth, and pass the ammunition." "Check out Michael Mann's book 'The Hockey Stick & the Climate Wars' about his battle against climate denialism." "I want to make mention of this book, a well-written book, well-researched book from a believer. 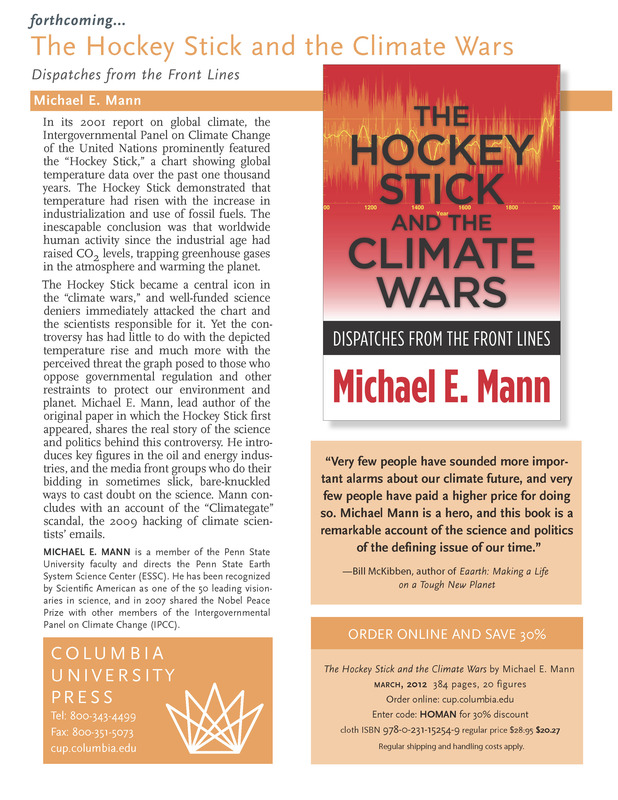 His name is Michael E. Mann, The Hockey Stick and the Climate Wars: Dispatches from the Front Line." The McLaughlin Group, "Broadcast: Weekend of May 31-June 1, 2014"
"[I]f you read just one book on climate change, make it Michael E Mann’s riveting exposé of disinformation and denial,The Hockey Stick and the Climate Wars"
—The Irish Times, "Books to Read in 2012"
"From climate scientist Mann, an important and disturbing account of the fossil-fuel industry's well-funded public-relations campaign to sow doubt about the validity of the science of climate change…This blistering indictment of corporate-funded chicanery demands a wide audience." "In this meticulous and engaging brief on climate change research and the political backlash to legitimate scientific work, Penn State professor Mann narrates the fight against misinformation from the inside...Mann balances the statistical analysis with charming personal anecdotes from his life and work. Careful descriptions of the methods and models behind climate change science bear out that assertion, proving that the only way to counter dangerous lies is to expose the truth, however inconvenient it might be. "Mann’s book provides a connected narrative detailing many aspects of the denialist campaign over the past decade." "'The Hockey Stick and the Climate Wars' is a must-read for anybody who follows the politics of climate -- or who cares about the frightening future our failed political system is about to unleash." "In 'The Hockey Stick and the Climate Wars', Mann sets out to tell his side of the story. Part autobiography, part furious exposé, this book is for anyone interested in the science - and filthy politics - of climate change." "Michael E. Mann...gives readers an inside look at a string of skirmishes going back to 1999 in which he has played a central role." —The New York Times "Green Blog"
"[T]hose who read his book will come away from it with little doubt that global warming is real and that we are the cause." "'The Hockey Stick and the Climate Wars' is a startling depiction of a scientist persecuted for trying to tell the truth." "[F]rom a general defense of academic scientific research into recent climate change, 'The Hockey Stick and the Climate Wars' is terrific, giving ample peer-review science references and making reasoned arguments." "Mann's shocking first-hand testimony of the repeated attempts to discredit him and his work gives his book power." "Michael Mann's expose of how the greedy dig themselves shows nothing has changed since the First World War." "I challenge anyone with an open mind, left or right, business or academic, to not be deeply disturbed by the attacks on science and scientists for political ends that Mann dispassionately describes...[T]he story is clear and vitally important to all citizens of a warming planet Earth." "The book's pay-off...lies in the overall impression he builds of the value of one researcher's determined defence of the science as it is - imperfect, beset by genuine disagreements over how best to extract signal from noise, but the best information we have." "Whatever your feelings about global climate change, this is a book you should read, because it clearly shows the contrast between how science works and how politics works." "I heartily recommend this book for an unusually clear view of the action on the front line of climate science from one of its principle palaeoclimate protagonists." "The strength of Mann's book lies in the light he sheds on how the scientific peer-review process works, along with his first-hand account of his role in the national political feud." "Mann deserves our respect and admiration for what he has been through and for his willingness to discuss it." Also listed as one of Physics Today's "Five books that stood out in 2012"
"Hockey Stick is a very readable, well-researched book, written in an informal style as it describes the personally bruising events, the battles lost and won, with clarity and reasonably good humor." "Mann's honest and thorough testimony on the attacks against climate science is a critical step toward resolving the climate change debate." "This book is well written and tells a remarkable story that is likely to be of interest to a wide range of readers." "'The Hockey Stick' is one of the most useful books yet in explaining climate science...It also offers one of the clearest and most damning examinations of the tactics used by climate-change deniers to distort the science of climate change and smear the reputations of climate scientists." "This must-read book recounts the expensive, well-orchestrated attack on one of the world’s most prominent climate scientists and climate graphs, the hockey stick…Mann deserves praise for taking the time to speak to other scientists and citizens about what threatens us all. He is not only a brilliant scientist but an ethical hero, a model for all." Pat Robertson Proves Global Warming is a Hoax: No SUVs On Mars! Dr. Michael Mann responds to criticism of his research and his new book in this letter to the Wall Street Journal. Bill Nye lists The Hockey Stick and The Climate Wars by Michael Mann as one of his ten favorite books that they would take to a deserted island.